The Petticoat Men tells the story of the owners of a boarding house where two men rented rooms – two men later arrested for the charge of dressing in women’s clothing. It’s set in 1870 and is based on the true story of the Lord Arthur Clinton scandal, involving the Prime Minister, Gladstone, and members of the royal family. 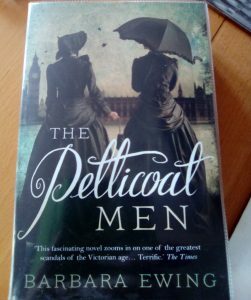 But the novel’s focus is not on the so-called Petticoat Men, or on the powerful people who knew them – but on the powerless, those affected by the scandal through no fault of their own. Mattie, a girl with a deformed foot, runs the boarding house with her mother – she is labelled a ‘crippled whore’ and their house is graffiti-ed as the ‘home of sodomites’. Mattie’s brother Billy finds his clerk’s job at Parliament under threat because of his association with the case. Without wealth, without power, how can these people undo the harm that’s been done? The tone of the book is interesting – at no point do any who know the Petticoat Men judge them unkindly. Only strangers, and the laws banning Indecent Acts, treat them harshly. The book is written from many viewpoints – first-person for Mattie and her mother, close-third-person for Billy, and a weird semi-close-third person mixed with omniscient-narrator for Mr Gladstone and the rest of the large cast. I found this rather off-putting, and would rather it be third person throughout. The dialogue and the quotes from newspapers and letters are exciting enough to keep the reader’s interest. I didn’t find the two first-person voices distinct enough to warrant their use. There were a few parts I skimmed over, mostly where rich people bemoaned their fate. The theme of influence, in its various forms, runs throughout the narrative. The strangest omission to me is that we never see the viewpoint of Ernest Boulton and Frederick Park, the Petticoat Men themselves, or know what they thought of any of it – or even, really, what they did, beyond the charges levelled at them. I’d be curious to know more about these men, who lived their lives so differently to the accepted social norm, who appear to be gay – it is not clear for a long time in the narrative – and who also simply enjoy wearing women’s clothes. I have whizzed through this book in a couple of days because of its high-stakes story about an aspect of Victorian life new to me, but I feel it could have done more with such an unusual topic and colourful cast of characters. There was a more satisfying ending than I expected, so that was good. I can see that Ewing has written a large number of other fiction books, with titles hinting at some of my key interests – archaeology, hypnotism, circuses, New York – so I will be looking out for more by her in the future. There are several photos of the people involved in this story and I must say I find these fascinating. The narrative says that Ernest looked, even when dressed as a man, like a woman in man’s clothes, and I can see from the pictures how this could be the case. Neil McKenna also wrote a history of the Petticoat Men, and this photo of Ernest Boulton is from his website.